Treat yo’self: standout silver under $300. Yellow gold is such a wonderful metal: warm, buttery, sunny against the skin. But you know what else is great? Good old sterling silver. It’s bright, it’s fresh, and it can shine like nobody’s business. Today’s edition of Treat Yo’self is all about stunning silver under $300. Katherine Jetter silver River Fern ring with amethyst or tsavorite garnet in rhodium plated sterling silver ($300). At Stone and Strand. Jane Diaz Hexagon Filigree Amulet Necklace in sterling silver ($110). Workhorse jewelry Sloane dagger earrings in turquoise and silver ($154). All images and info in this post is thanks to the seller of each individual item. Please see descriptions above for links to original listings. This post contains affiliate links. Part 2: photos from JCK LUXURY Privé. I promised to there would be more JCK LUXURY Privé photos, and here they are! Don’t forget to go back and catch Part 1 if you missed it (or if you just want to revisit those beauties). This gorgeous tiara is the work of Greek designer Thyreos Vassiliki. It’s made of 18k gold and diamonds. It’s surprisingly light and comfortable. Everyone at the JCK Blogger’s Preview had a ball trying it on. Here’s a cuff bracelet by the same designer. I love the presence it has with its bold, sculptural feel and the interesting texture on the gold. I think these diamond ear climbers by Rina Limor are just about perfect. They look like crystallized soap bubbles, tiny and light and wonderful. I would wear them with everything. I could not get enough of the colors in this line of amazonite jewelry with tsavorite garnet and diamond accents from Doves by Doron Paloma. Don’t you want to wear this pendant on an island? I always jump at the chance to see Omi Privé’s jewels in person, and these two beautiful blues were no disappointment. The left is a tanzanite, right is a sapphire. Here’s a better look at the tanzanite. A fabulous yellow gold and emerald pendant by Omi Privé. Such a dark, bewitching beauty to this piece. A super-cool, vaguely 1970’s sautoir by The Mazza Company: this beauty is made from black onyx, red coral, and 14k gold. A hand full of rings by Simon G and Sethi Couture! You know I can’t resist an opportunity to stack. Neha Dani had several extremely cool pairs of earrings on display; these were my favorites. Aren’t they stunning? Like gilded sea coral. Speaking of standout earrings: check out these, by the fabulous Sethi Couture. The colors, the lines! That’s blue sapphires, white diamonds, and tsavorite garnets making up that beautiful design. Here’s a pretty opal and diamond ring by Spark Creations. How great is that side detail with the gold frond reaching out over the surface of the opal? That’s my favorite part. These two Art Deco-inspired cocktail rings are by ZIVA jewels. Aren’t they delicious? Up close and personal with that square ZIVA ring. I couldn’t get enough of this cabochon gemstone and diamond bracelet by Vivaan. You know how I feel about colorful jewelry. I visited the Mastoloni Pearls booth, where I had the great privilege of playing with this river of natural pearls. I also had the chance to check out Mastoloni Pearls’ ear climbers, which I’d heard were fantastic. And they are: so perfectly proportioned and so comfortable to wear. One last peek at that Omi Privé tanzanite. Sigh. As before, I want to thank JCK Events, Communique LA, and all of the vendors who took the time to show me their beautiful wares. I had a truly glorious experience. Did all of those pretties put you in the mood to add to your own jewelry collection?? Don’t forget to enter my contest to win a free antique pearl and diamond pendant! Assorted beauties from the the 2013 Tiffany & Co Blue Book. I promised you more 2013 Tiffany & Co Blue Book, and I intend to deliver on my promises. If this batch has a theme, it’s rich, glorious color. To dive right into the color: how luminous are these two gemstone rings? They look like they’re on fire from within. Both setting are platinum adorned with diamonds; one features an unenhanced cushion-cut yellow sapphire and the other, an orange sapphire. This necklace is one of my favorites from this year’s Blue Book and (unsurprisingly) another piece that shows a strong Art Deco influence. 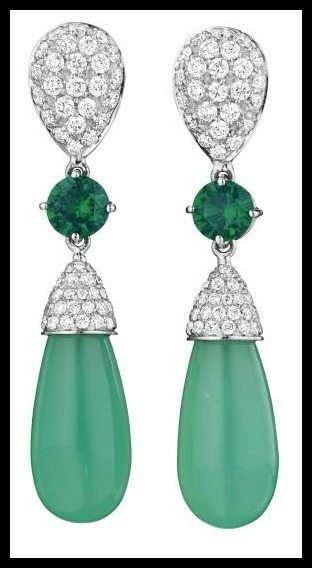 The tassel of gloriously green tsavorites dangles from a platinum and diamond cap suspended from a platinum and diamond chain. I could not be more into this color. Speaking of marvelous color…feast your eyes upon these earrings. They feature oval spessartites glowing within scrollwork of diamonds in platinum. I say infinite amounts of yes to these. A quick jump back to cool colors for this fantastic bracelet. It’s composed of five rows of tanzanite beads, perfectly finished by a clasp of diamonds and milgrained platinum at the end. This is the Shell necklace by Jean Schlumberger for Tiffany & Co.. It’s made of 18ct gold and is adorned with cabochon rubellite. How fantastic is that detail? Exactly what I’d expect from a Schlumberger piece. Last but not least, we have this bangle with spessartites, tsavorites, yellow sapphires, fancy sapphires and diamonds in 18ct white gold. I think it looks like Autumn leaves. 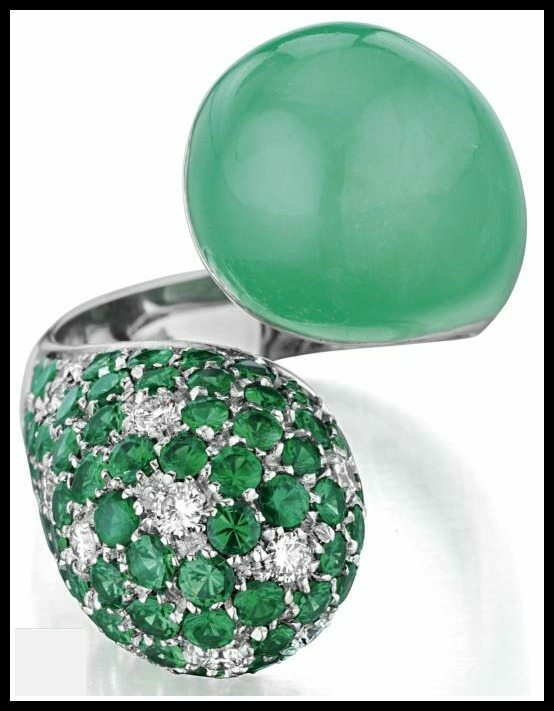 I can’t tell you how excited I am to see all of these gorgously-hued pieces in the 2013 Tiffany & Co Blue Book – I’m hoping it’s a sign that the red carpets of next year will showcase more colored gems, instead of just white diamonds. All images and info in this post are thanks to the Jewellery Editor’s wonderful feature on the Tiffany & Co Blue Book Collection. 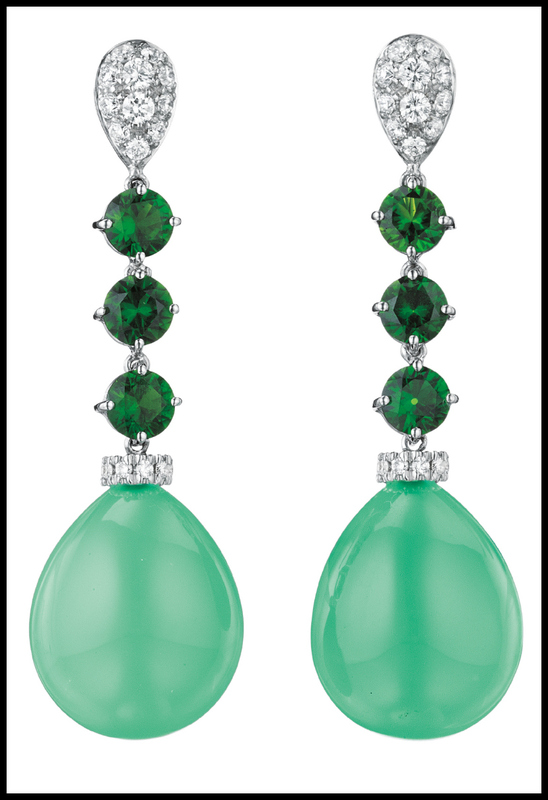 Hemmerle emerald and tsavorite tassel earrings. These earrings aren’t really my usual style but I find it impossible to look away from them. Just look at those luscious, verdant tassels. They’re like a forest. I bet they’re perpetually cool to the touch. These two tiny masterpieces are the work of renowned contemporary jeweler, Hemmerle. The dome-shaped surmounts are adorned with vivid, circular-cut tsavorites set in rose gold. 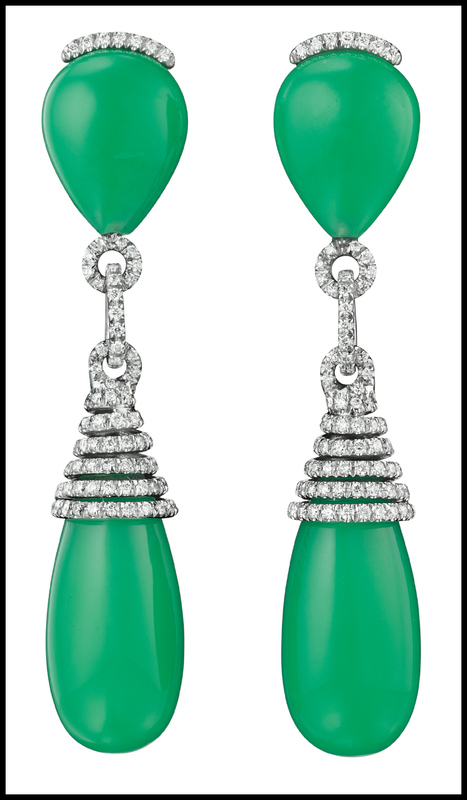 The surmounts each suspend a tassel of graduated emerald beads. The two tassels weigh approximately 103.04 carats and mounted in copper. I wonder what they look like on the ear – do the tassels dangle directly beneath the earlobe, or hang in front of it? I’d love to see a picture of these being worn. These glorious earrings are currently for sale at FD Gallery, listing available via 1stdibs. All images and info are thanks to FD Gallery and 1stdibs.